CHECK THE Latest Jobs in DOHA QATAR – Also check the latest Jobs in Doha for freshers .Candidates who are interested Can Send CVS SOON FOR SHORT-LISTING Candidates will be Interviewed by client by the End of April 2017. Candidates must be Post graduate in Civil Engineering with 10 / 15 Years Exp. PMP Certified will be Preferred with GCC Experience is must. ENGINEERS – Construction Manager, Project Engineer, Site Engineer, Sr. QA / QC Engineer, Sr. Project Quantity Surveyor. SAFETY PROFESSIONAL – Safety Engineers, Safety Officers Graduate in Civil, electrical, Mechanical Only Construction related Filed, NEBOSHICG 1, 2, 3 is must Gulf Exp. Both ECR ECNR can apply. Mason 1400 Qatar Riyal, Painter Min 1000 Qatar Riyal, cleaner Min Contact for More Details between 10 AM lo 6.30 PM Ms. Waseema: 9704675049 Ms. Noorjahan: 8886644884. 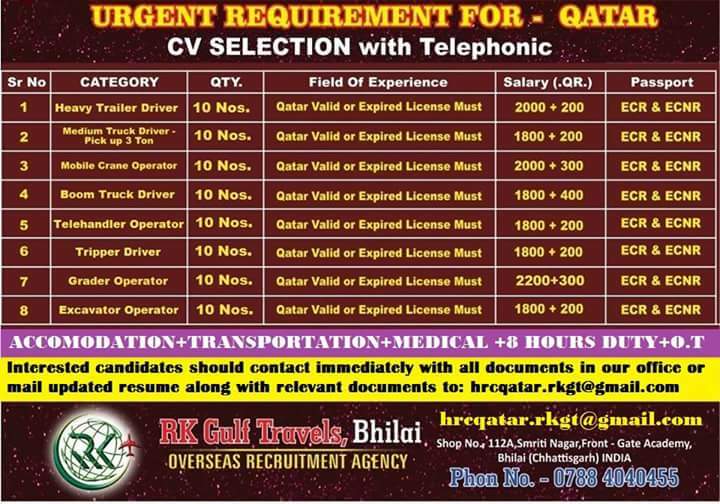 Benefits: 8 Hours Duty overtime Free Accommodation Transportation Medical all other benefits as per Qatar Labor Law. Email Id dotravelpointhr.com. Ground & 1st Floor, Gupta Estate, opp Babu Khan Estate. HYDERABAD Road. Parisrama Elhavarsi Bank, Basheerbagh. I am mister Sohel Ahmed my Experience HVAC Installation & maintenance Aziz trade Engineering Ltd.01/08/2010 till Date 6 yearsExp:& Rangs group HVAC Industries Ltd.or LG Bangladehs Ltd.or Transcom Bangladesh Ltd.or Union group VRF Ac. Hi sir I am Mohamed Sifan I have a qatar Valid license. I am now in qatar living. Then I have driving experience 6 years. My mobile number is 50545971.